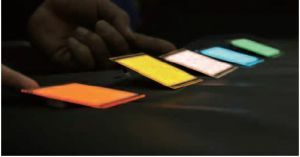 According to a news report from Japan, Kaneka developed a new OLED panel that achieves a lifetime of 50,000 hours, almost double from the company's current OLEDs. The panel is 8x8 cm in size and 1 mm thick. Kaneka has a small production line with an annual capacity of about 20,000 panels. The company plans to expand the production capacity with an aim to halve the manufacturing costs. Kaneka plans to achieve OLED sales of ¥50 billion (around $450 million) by 2020. We do no have more information about Kaneka's new panels. The company's current OLEDs are not very efficient (about 20 lm/W). In January 2014, however, Kaneka signed an OLED technology license agreement with Univeral Display, so hopefully the new panels use phosphorescent emitters and are more efficient. Kaneka: our OLED Lighting panels are "ready to be shipped"